Living Colour Blog: Wade In The Water - A Solidarity Jam featuring Living Colour's Corey Glover + special guests! 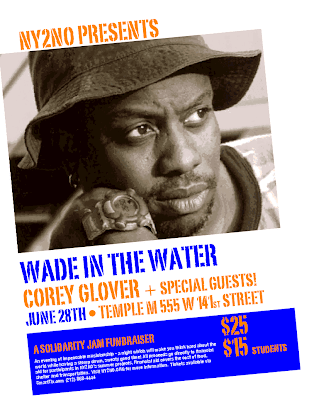 Wade In The Water - A Solidarity Jam featuring Living Colour's Corey Glover + special guests! This will be an evening of impeccable musicianship – a night which will make you think hard about the world and your own inner life, while having a stomp down, sweaty good time! All in a community of love and like-minded freedom-fighters. Living Colour’s guitarist Vernon Reid (one of Rolling Stone's 100 best guitarists of ALL TIME), vocalist and multi-instrumentalist V. Jeffery Smith of The Family Stand, and Dean Bowman, former lead singer of the Screaming Headless Torsos are among the musicians scheduled to appear. On Sunday, 6/28/09 we plan on taking it to church at Temple M. Join us. Temple M is possibly Harlem’s best-kept secret, a federal masterpiece of Newport dimension, with a French twist, nestled in historic Hamilton Heights in Harlem. It was built in 1917 from the assemblage of two adjacent Victorian mansions, on the same charming tree-lined street as the Alexander Hamilton Grange. Temple M is now blooming after four years of focused vision and restoration, dedicated to honor a reviving Harlem and the vibrant soul of this building, which is said to have been once a Synagogue, and then a Church. The capacity at Temple M is 200 people, so please don’t risk being turned away at the door. This is a one night only event.